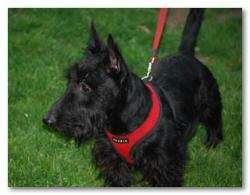 Happy Ever After: Franklin – Scottish Terrier Club of Greater New York, Inc.
Franklin was a one year old, adorable male Scottie who came to us off Craigslist with no information at all. He is a sweet and cuddly boy, full of terrier energy, yet loving to sleep under the blankets with you. It was difficult to let him go because he was so cuddly! Franklin belonged as an only dog, because he wasn’t the best at sharing with others. He was placed with two sisters who own a lovely condo in Greenwich, CT. One is a music teacher and the other a lawyer who works mainly from home, so he gets plenty of time, love, patience and attention, which was what he craved most! Please help us continue our Rescue work with your donation today!